According to the United Nations Development Programme's 2015 Human Development Report, 35 of the world's 45 poorest countries are in Africa. Most African governments are still struggling to meet the basic needs of their people, especially food security. The report identifies sub-Saharan Africa as faring particularly badly: "Of the ten countries with the highest levels of hunger, and of the ten whose scores have actually increased since 1990, nine are in sub-Saharan Africa in both cases". The situation is worsened by the fact that over 70% of food produced in these countries comes from vulnerable rainfed small-scale farms, which operate in fragile environments that are ecologically, geographically and economically marginalised, and, therefore, especially hard-hit by droughts. There is a close link between climatic patterns and production outcomes, and timely, accurate and reliable information on weather can contribute to food security in Africa. From Africa to Asia, Australia to Latin America, small-scale farmers have, for centuries, made use of indigenous knowledge systems to make decisions on what crops to plant and where and even how to plant and harvest their crops. In the context of weather forecasting and drought monitoring, farmers observe the behaviour of animals, insects and birds, and the fruiting and flowering patterns of trees to indicate important weather phenomena. This knowledge about the sensibility and reactions of fauna and flora to atmospheric variations and climatic conditions has been handed down by word of mouth for generations. Since time immemorial, communities in Africa have used their knowledge to prepare themselves for any eventuality—adapting their agricultural practices and food storage practices to cushion them against food insecurity. While mainstream science has well-developed methods for generating seasonal climate forecasts and has tailored these to feed application models such as crop models, these forecasts generally produce forecast information at 'coarse spatial resolution’. The probability of seasonal rainfall is presented as being "above normal", "below normal" and "normal" compared with historical trends. Small-scale farmers in Africa do not relate to this kind of information. First, it is disseminated using channels (newspapers, television and websites) to which the farmers do not necessarily have access and, secondly, the farmers do not understand the language used. This is where information and communication technologies (ICTs) can help. Droughts cannot be prevented but their effects can be mitigated through community-driven sustainable and effective early warning systems using appropriate ICTs. Dr Muthoni Masinde, a computer scientist, as part of her PhD studies at the University of Cape Town, developed a system that integrates indigenous knowledge and scientific drought forecasting approaches using mobile phones, wireless sensor networks and artificial neural networks. The name for the system, ITIKI (Information Technology and Indigenous Knowledge with Intelligence), was inspired by an indigenous bridge used by the Mbeere people in Eastern Kenya. Masinde's doctoral thesis showed that ITIKI produces forecast models with accuracies of 70% to 98% for lead times of one day to four years. ITIKI comes with a language translation service that enables farmers to access the tool in their local languages. Sound files are also available for the farmers who cannot read or write. Her employer, the Central University of Technology, is currently working with the South African Weather Service to roll out ITIKI in South Africa, Mozambique and Kenya. 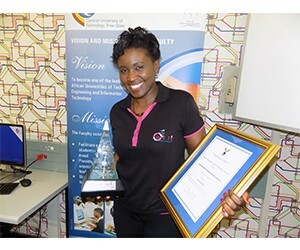 The novelty and relevance of ITIKI were recognised by the International Telecommunication Union, the BBC, Reuters and the New York Times, and saw Masinde emerge as the 2016 winner of the Distinguished Young Woman Scientist: Research and Innovation category of the South African Women in Science Awards. In May 2017, Masinde received funding of US$500 000 from the USAID's Securing Water for Food programme. This will enable her to convert the drought tool into a viable business. Dr Muthoni Masinde works as a senior lecturer and Head of the Information Technology Department at the Central University of Technology.